Sonic the Hedgehog has always been a favorite hero of mine. The combination of fast speed, slow platforming, and can-do attitude always enamored me. Heck, I even enjoyed Sonic Heroes and Shadow the Hedgehog if that gives you any indication of my admiration for the little blue hedgehog. Now, a new game has come out, and it's Sonic Colors for Wii. Finally, that title we Sonic fans don't have to be ashamed of liking! The poor blue hedgehog has had it hard for the past decade. The consensus is that his 3D exploits aren't any good. You can blame the Sonic Cycle for part of that. Getting excited for the initial game, starting to turn on the game by seeing an unnecessary gameplay gimmick in Sonic's newest adventure, and then the game turns out to be garbage. Many a Sonic fan has fallen for this time and time again. They're not that bright of a bunch an outsider might say. 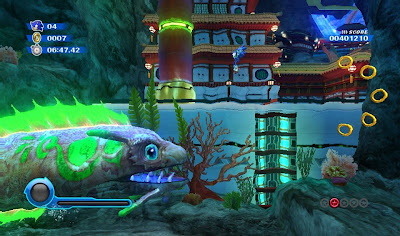 Regardless, Sonic Team's newest attempt unveiled its gimmick when it was announced, Wisps, alien creatures that give Sonic special powers when used. 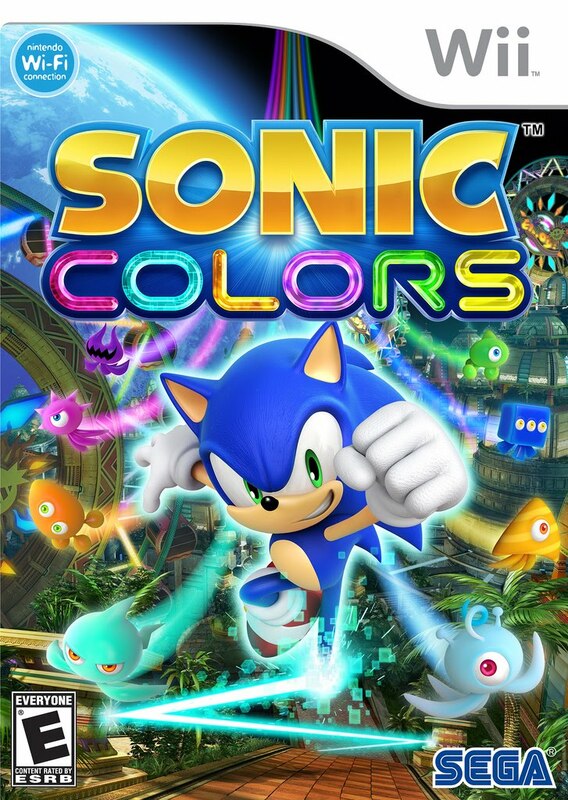 Does Sonic Colors fall into the Sonic Cycle, or does it speed its way far from mediocrity? Dr. Eggman has opened up a new planetary amusement park to atone for his past sins against man and robot kind. Sonic, not believing Eggman's turn to good is for real, enters the amusement park to see just what Eggman's scheme is this time. Could Eggman actually be on the side of good this time? Spoiler: no, he's apparently using the power of the alien creatures, Wisps, to power his amusement park as well as his robotic creations. Can't say Sonic's intuition was wrong this time! So now it's up to Sonic with help of Tails to right the wrongs of the evil Eggman and save the planets that Eggman has imprisoned inside his park. Not to mention rescue the Wisp population! There are seven areas in Sonic Colors. There's Tropical Resort, Sweet Mountain, Starlight Carnival, Planet Wisp, Aquatic Park, Asteroid Coaster, and the final zone. Each area of the game save for the final has six acts each ranging from long to short and concluding with a boss battle at the area's climax. These boss battles are sadly reused once each, so you're really only facing three unique bosses in all six main areas. Also on the world map is the Sonic Simulator. By collecting red rings (don't worry, Xbox 360 owners, these are good ones! ), five in each act, more stages open up in the Simulator. There's three acts for all seven worlds, and beating each third act rewards the player with a Chaos Emerald. I won't spoil what collecting all the Chaos Emeralds does, but let's just say it's a nice playable surprise that we've seen in past Sonic games. As soon as hit new game, you're immediately thrust into Act 1 of Tropical Resort. There's no cut-scene, no introductions, it feels like how the old 16-bit Sonics played. Of course, as your progress through the area you come across two or three cut-scenes. These cut-scenes are clever and are decidedly for the younger set, but darn me if I didn't giggle at some of them. If it's a Sonic game, you can bet there will be rails to grind. Sonic Colors plays quite differently from past 3D Sonic games. You see, it's actually good. Nearly 75% of the game plays in 2D while the other quarter plays in a 3D/straight path fashion. The 3D sections surprisingly control well with the ability to drift around sharp curves like a knife on butter-- smooth. The quick step ability is used to efficiently move a step to the left or right in a fast manner. 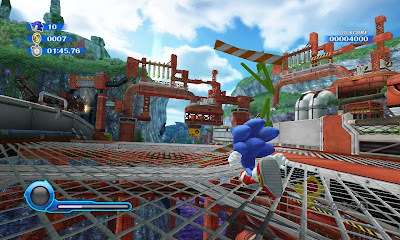 Sonic can use his boost ability to speed through robots and anything else that gets in his way, all the while rings will flock towards Sonic during this maneuver. The 2D portions feel the most Sonic-like. This is 1994 Sonic. mind you. New to the series is a double jump to reach extra heights or save yourself from falling to your death. 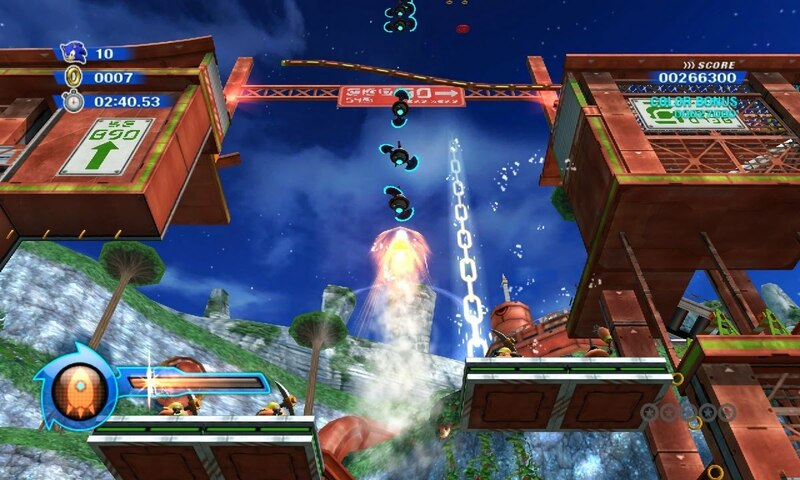 As a beneficial help to the player, bottomless pit segments are marked with a yellow, exclamation pointed triangle caution sign appears at the bottom of the screen to warn of upcoming dangers to Sonic. It's better than speeding blindly into death without warning. These 2D sections are wonderfully made. There's classic loop-de-loops, moving platforms, gravity sections, underwater areas where that blasted drowning jingle with play but in orchestrated glory, and boxes that will push you off the screen into death if you don't time your leaps just right. The primary gimmick this time around are the Wisps, the creatures that enable Sonic to use different abilities. One provides boost energy while another allows Sonic to blast off and rocket high into the air for secret sky-high goodies. The light blue Wisp gives Sonic the ability to turn into a laser, bouncing off objects and through crystallized paths as if he were a beam of light. There's a massive amount of Wisps to collect in the game, but not all are open to Sonic to use right away. On the first act of the game, you'll be taunted by a yellow Wisp pod that you can't utilize yet until you've unlocked it. You'll have to come back to the act once you've unlocked it to use it. This aforementioned Wisp allows Sonic to burrow deep underground and underwater searching for subterranean goodies. I was afraid the Wisps would ruin the title, but instead they add to the formula offering even more exploration than I thought possible. I was glad to be proven wrong (as I usually am). In order to simply "beat" Sonic Colors, you must play through all thirty-eight (math was never a strong suit) acts of the game, playing through all seven areas of the game, and taking down the final boss of Sonic Colors. If this sounds like all you want to do, then a rental is in order. However, perfectionists and completests will want to collect all 180 Red Rings, five per act. Some of these are in wide-open locations while others are cleverly hidden in creative ways. One example is a Red Ring hovering over a pit with self-destructing boxes placed over. What you need to do is use the pink Wisp's spikes power to carefully scale down the wall, leap on the self-destructing box to make it cause a chain reaction to explode the other three, and then perform a jump off the wall followed by a quick double jump to snag the ring and make it to the other side of the room safely. Phew. Even typing that tuckered me out! Whoa, nelly! This sea is rough on a hedgehog! 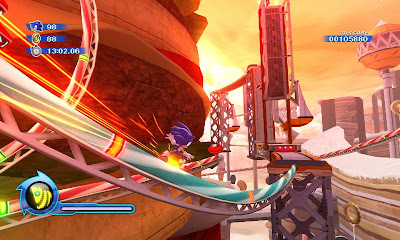 Visually, Sonic Colors is as it name suggests-- vibrant, colorful, beautiful with a nice glaze of pretty. The backgrounds and worlds are brimming with things for your eyes to explore-- if you have the time, you know, speeding along as Sonic. The character models are sensational and animate wonderfully. The new voice actors sound much better than the old 4Kids cast (not to say they were horrible, mind you, just not as great) with Tails actually sounding like a boy! Huzzah! Meanwhile, while we're talking about sound, the soundtrack is absolutely fantastic with many memorable tunes and songs. This could be soundtrack of the year material, folks. No hyperbole intended. Sounds like a good solid Sonic title, though it will be a long while until I play it probably. The last Sonic game I purchased was Sonic Adventure the day I purchased my Dreamcast on 9-9-99.